In this review, we will go over the pros & cons of the CYBERPOWERPC Gamer Xtreme VR GXiVR8100A Gaming PC as well as seeing if the hardware adds up to the price. 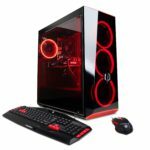 When you’re in the market for a pre-built gaming desktop today then you need to be aware of what the hardware inside the PC is meant for as well as knowing what other desktops or possible build types it can be compared to. After going through this post, you should be able to understand whether or not this PC is the right one for you. With that, let’s get to the review. Best Gaming PC Build Under $500 Dollars, This PC Will OWN in 2019! Colton P on Digital Storm Computers Review, Does Building Your Own Make More Sense?